The primary research interests of Dr. Liu’s group lie in remote sensing, geographical information sciences and their applications to environmental analysis and modeling. Recent research projects have been funded by NSF, NASA, and NOAA Sea Grant programs. 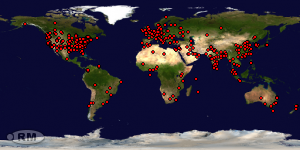 These projects have generated various algorithms and software tools for processing remote sensing and GIS data as well as journal publications in a wide range of geo-scientific topics.